Graphics & Photo Software Editing Images: In Context! Images: In Context! 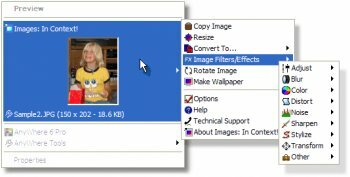 is a powerful, easy to use image editor that integrates directly into Windows. It is easily activated by simply right-clicking on the file or files you'd like to work with, allowing you to edit your digital photos with 70+ effects, filters and functions.